I don’t really but I have had rather a spooky encounter in the past that could have been a ghost (I’m still not 100% convinced but you could judge for yourself – read about it here). Maybe there is something in it – maybe not. My feeling is that if ghosts really do exist then at some point we all must have seen them or at least felt their presence. The house I live in is over a hundred years old and I am certain that at least one person must have died in it during that time. Yet I have never felt, seen or heard a ghost in my house – and neither has anybody else that I have known of. In fact, none of my friends, acquaintances or work colleagues have had an encounter with a soul from the afterlife either. If ghosts really exist then this is a weird thing. I read an article surmising that for every living person today, there are 15 dead people, which means that, potentially, there are 105 billion ghosts wandering the earth. Whenever we walk the streets of our towns and cities there are 15 spooks also wandering the streets for each of us. 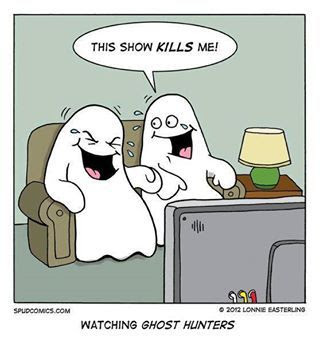 I sometimes watch weird videos on YouTube featuring all manner of creepiness, ranging from aliens, to lizard people, ghosts to demons, yet when I watch supposedly genuine images of ghosts caught on camera, I cannot help but chuckle because, to me at least, they like elaborate hoaxes. I’m pretty sure that your everyday psychic would disagree with me, suggesting that not only have these spirits allowed themselves to be caught on camera, they are also able to communicate with certain special people, like a psychic, a person who claims to be able to perceive a different wavelength of reality and as a result can talk to ghosts. They are lying, dear reader. However, I don’t want to drift into telling you that all psychics are charlatans (deep down you know that already). What intrigues me about the videos you see on YouTube is that they are very well done, so well done in fact that you can barely see the cracks in some of them. One of the best of these videos is from my adopted home city of Manchester. The video contains CCTV footage from a number of cameras scattered around an office in the city and the security guards on duty flicking between the cameras as spooky things were happening. Now I loved watching this and, almost as much, liked reading the comments on it. What struck me is that it was recorded on the night of 1st November 2012, that is Hallowe’en night. It is very well done and could, I think, convince anyone who is even slightly gullible. Since then a Ghost Hunter has debunked the film as a hoax. What’s more interesting is the term “Ghost Hunter” because until I read that article, I thought that a Ghost Hunter was a figment of the imagination of authors and writers who wrote scary fiction about ghosts. I am amazed that there is a Ghost Hunter in Manchester – in fact there are possibly more. People exist who actually go out to find ghosts or at least deal with situations where people think they are being haunted. While I love this kind of spooky nonsense, I don’t think I would want to go out in search of them, just in case I actually discovered that spooks really exist after all. But if you had a heart of steel and fear is not part of your DNA, how would you set about becoming a Ghost Hunter? First of all, you probably need the equipment. And it is not cheap. An accelerometer to measure even tiny vibrations in objects. Video recorders and cameras (obviously – though I am not convinced that ghosts can be photographed), including special infra-red equipment to detect weird stuff in the infra-red spectrum. Sound recorders to detect abnormal sounds. Spectrum analysers to detect energy out of the normal perceivable ranges. Thermal cameras to detect changes in temperature. Various other essential equipment such as X-ray and UV scanners. Obviously, you also need to be totally laid back, methodical, patient, confident and, most importantly of all, not prone to squealing like a little girl should you ever see an actual ghost. Of course, if you can talk to the ghosts when you find them, that might be a bonus but, since nobody can talk to ghosts, that is just a little wishful thinking. Finally, you have to have an open mind and not be, like me, a totally cynical sceptic. I know that I may be mocking what could potentially be a fulfilling, if not totally weird career path and for that I apologise. To be honest, if there are any genuine Ghost Hunters out there, please leave a comment and I will read it with an open mind.